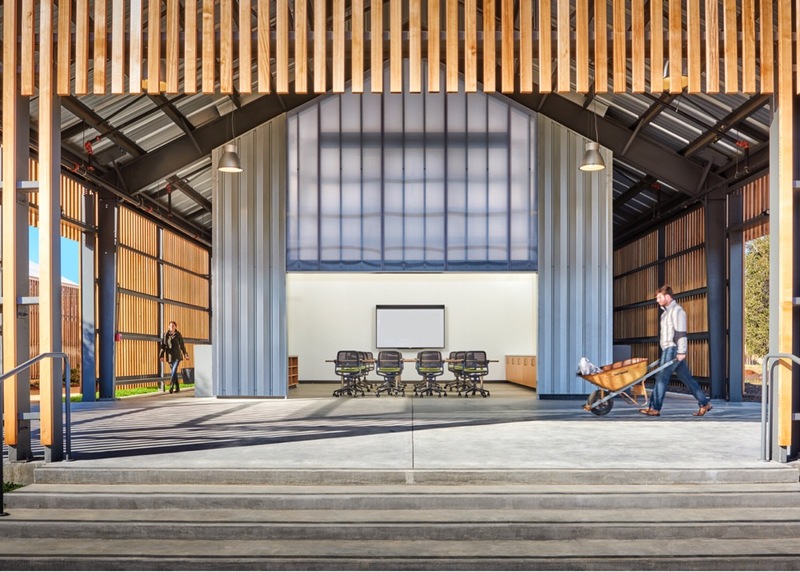 There's a new couture addition to PROXY, the temporary shipping container village in San Francisco's Hayes Valley, designed by architects Envelope A+D. Adding to PROXY's cool coffee shop, ice cream parlor, and Biergarten is a new store for clothing company Aether, made up of three forty foot shipping containers stacked atop one another, supported by steel columns. 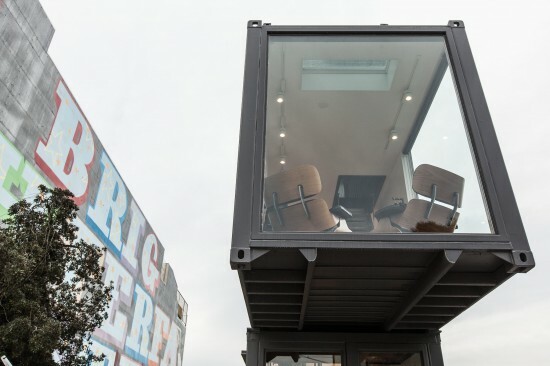 The guts of the first two containers have been carved out, making a double story retail space, with a glass mezzanine above jutting to the side, providing display space and views. A third container for inventory storage is accessible via a custom-designed drycleaners' conveyor belt spanning all three floors. Workers can literally load garments from the ground floor and send them up to the top. PROXY, which has been a huge success, is planning more. The next installation: PROXY_storefront, a series of 9 storefront spaces carved into six shipping containers, to be located around the corner from Aether. Indeed shipping containers are moving beyond residential, taking off in the retail realm. You can visit the new Aether store in person Tuesday through Saturday from 11:00am to 7:00pm or Sunday from 11:00 to 6:00. That Empty Lot Problem? Solved. 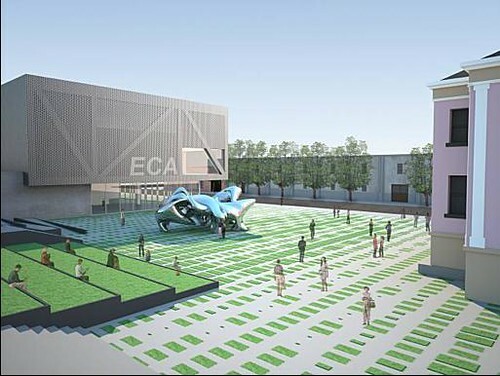 While the recession has put a damper on development along San Francisco's Octavia Boulevard, the mayor's office has reached out to Douglas Burnham of Envelope A+D to come up with something cool to temporarily fill the two vacant lots that front Hayes Green at the intersection of Octavia and Fell. Burnham's plan sounds like a lot of fun. 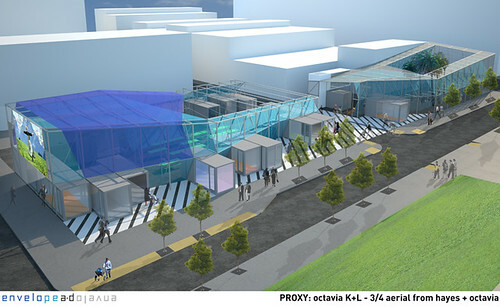 He plans to transform the space into a mini-shopping, dining, and entertainment destination called PROXY--using a series of modular units that will be recyclable in two or three years when things ratchet up again. 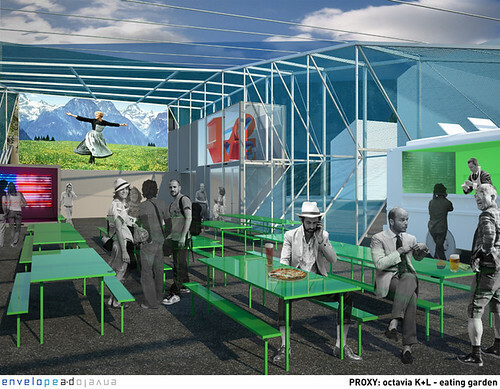 The vision includes a group of pop-up stores, a food court served by "slow food" carts, an art gallery, and a courtyard for projecting outdoor movies. Design-wise, the spaces will make their transient nature apparent, revealing their infrastructure (e.g., wiring, water storage) and their modular assembly. We know what those contrived shopping-n-dining plazas feel like (to wit: Santana Row), so we can't wait to see what happens when you have an architect as the prime mover. With buy-in from the city and from the neighborhood association, Burnham plans to put things in place this spring. See below for an idea of what will replace a parking lot and a bunch of weeds. How inspiring is that?